Internationally acclaimed since 1897! Low fat! Cholesterol free! Oven baked! www.angonoa.com. Since 1897, Angonoa has been bringing you, the customer, a high quality, delicious and nutritious snack for everyone to enjoy! 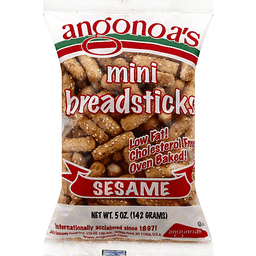 Low in fat, with no saturated fat, no cholesterol and no trans fat, Anganoa Breadsticks are ideal for snacking or entertaining, and a great compliment to soups or salads! And remember, you can only be right with Angonoa!